Finding quality furniture is an integral part of interior design, it can simply make or break the whole design concept. when choosing furniture for your house, you need items that are well designed, elegant, unique and most importantly, durable. And you also innovative accessories to complement those furniture pieces. If you live in Bahrain and happen to be decorating or redecorating at the moment, you probably need to find the best furniture shops in Bahrain. The Kingdom in Bahrain may be small in area, but it boasts a large number of shops and stores. You can always find high-quality goods in Bahrain if you know where to shop. So, if you happen to be looking for quality furniture in Bahrain, here is a list of some excellent stores for you. Kare design is an international chain that was established by two friends in 1981. It started as a single shop in Munich and is now available in more than 40 countries around the world. Their designs are full of imagination and creativity, and they are certainly never boring, they can add a unique liveliness to your house. The KARE brand simply symbolizes furnishing ideas that are unique and unconventional. Ever since the company started, it has been surprising its fans worldwide with an incomparable variety of designer collections. One of the most popular furniture shops in Bahrain, and definitely one of the most sophisticated ones. 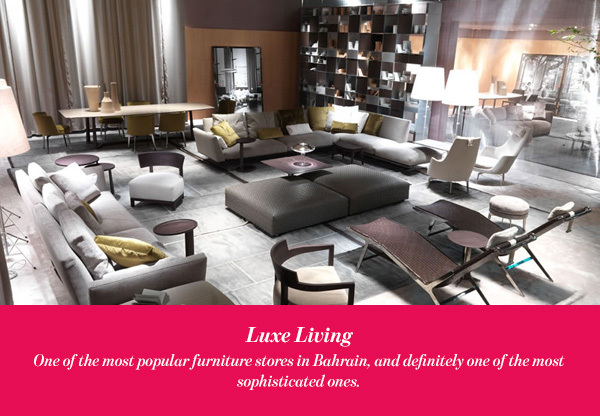 Luxe Living brings you different collections from top renowned brands such as Fendi and Kenzo. So if you are looking for upscale furniture this is definitely the place to go. They have an exclusive showroom with well-known premier furnishing Brands and signature home accessories here in Bahrain. You can find outstanding furniture and accessories to every room in your house there, including your outdoor areas, and even your office. 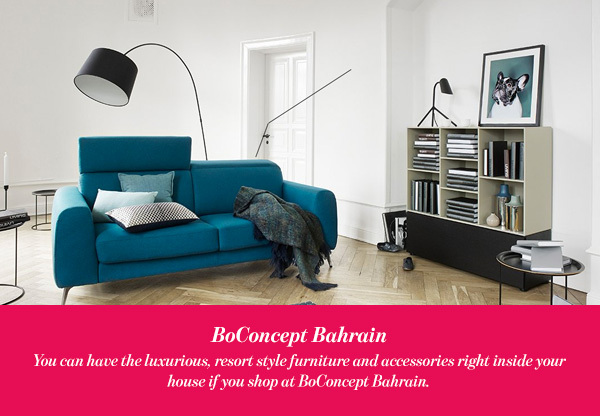 You can have the luxurious, resort-style furniture and accessories right inside your house if you shop at BoConcept Bahrain. BoConcept is a brand name that started in Denmark and is now available in 60 countries around the world. Their extensive showroom in Al Seef is one of the biggest furniture stores in the country, it provides all what your house needs under one roof, and with excellent quality. Elegant contemporary furniture, made in France, with a five-year guarantee, what more can a person wish for? One of the largest furniture shops in Bahrain, Gautier Manama offers a variety of designer collections that are made to world class standards. Their exclusive designs are truly innovative and unique. One of the best and biggest furniture shops in Bahrain, ID Design offers thousands of furnishing items in a variety of styles and designs. 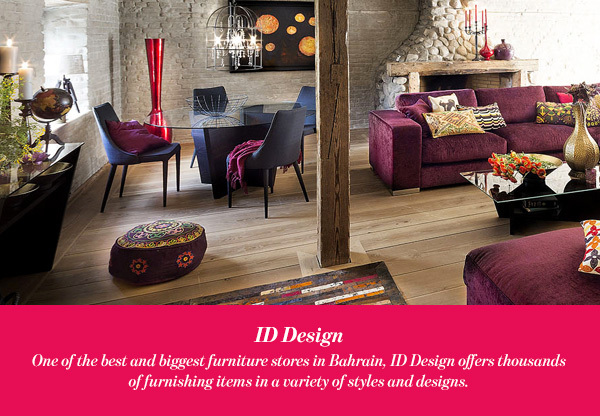 ID Design is an international brand with stores all over the world, they make quality modern furniture and accessories. ID design Bahrain started operating in December 2004, and due to their enormous success, they have three branches across the country now. All their furnishing items are of very high-quality materials and elegant unique design to offer you and your family the elements for a beautiful and comfortable home. 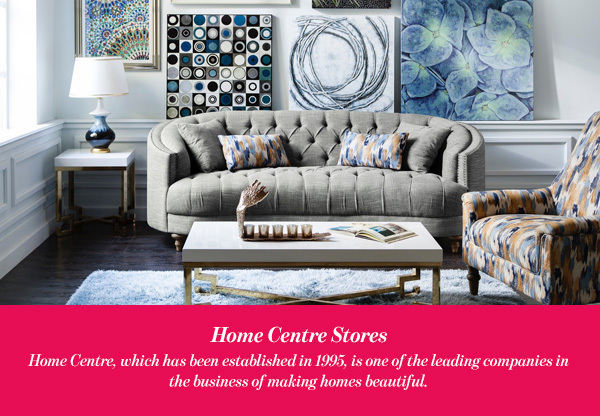 Home Centre, which has been established in 1995, is one of the leading companies in the business of making homes beautiful. It has started as a single store in Sharjah, UAE, and is today one of the most popular home shopping destinations in the region. You can find an extensive collection of furniture and accessories at their stores in Manama and Riffa. They promise to always deliver outstanding value, continuous innovation, and exceptional customer experience. 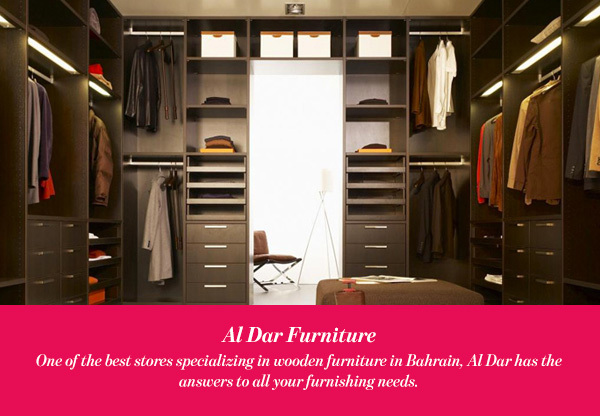 One of the best stores specializing in wooden furniture in Bahrain, Al Dar has the answers to all your furnishing needs. The company provides practical solutions for the modern day home and working environment through its eco-friendly, comfortable and durable products. Al Dar Wood Furniture Factory offers a variety of products to cater to the specific needs of each of their clients. With well-designed carpentry work that incorporates new technology.